Vitamin C (L-ascorbic acid) is an antioxidant known for its health benefits, but it's also beneficial for your skin. As research continues to support its anti-aging abilities, more and more skin care companies are including vitamin C in their products. According to the Linus Pauling Institute Micronutrient Information Center, vitamin C's "antioxidant properties and its role in collagen synthesis" is what makes it critical for skin care. Vitamin C is found naturally in the skin's inner and outer layers, but aging, smoking, and exposure to sunlight and ozone reduce its amount. Vitamin C is transported to the skin through the bloodstream, and vitamin C supplements increase its levels in the skin. As an antioxidant, it seeks out and neutralizes skin-damaging free radicals. It helps protect the skin from UV light and helps reduce sun damage, especially when used with vitamin E.
It is integral to collagen synthesis. Collagen is an important protein, which helps make new skin and improves its elasticity. When combined with soy or another depigmenting product, it helps reduce skin hyperpigmentation. It has anti-inflammatory and wound healing properties and may help relieve acne and rosacea. Of these, magnesium ascorbyl phosphate is the most stable and preferred due to its absorbability, its hydrating effects, and its free-radical abilities. Additional vitamin C derivatives are being researched. Once opened, products containing ascorbic acid have a short life. Since magnesium ascorbyl phosphate is more stable, the effectiveness of products made with this ingredient lasts longer. The following products are made with ascorbic acid or magnesium ascorbyl phosphate and are marketed to reduce wrinkles and aging, and brighten skin. The Body Shop Vitamin C Facial Radiance Capsules: This best-selling product contains ascorbic acid and other natural ingredients. It's paraben-free. A jar of 28 capsules costs about $30. Avalon Organics Vitamin C Renewal Serum: This serum is made with ascorbic acid, botanicals, extracts, and essential oils. It's certified organic. A one-ounce two-pack costs about $23. Philosophy Turbo Booster C Powder: This powder is added to your daily moisturizer. Its main ingredient is ascorbic acid. A .25 ounce bottle costs about $40. Ole Henricksen Total Truth Vitamin C Eye Cream: This products contains vitamin C in the form of magnesium ascorbyl phosphate. It also includes SPF 15 sun protection. A .5 ounce jar costs about $45. 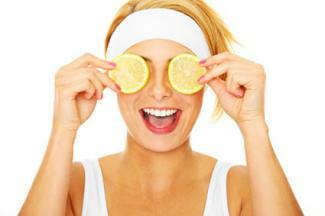 Vitamin C is a potent antioxidant that offers sun protection and fights premature aging. When used as directed, vitamin C is safe and causes few, if any, side effects. Remember, there's more to healthy skin than just one ingredient. Eating healthy foods including vitamin C-rich foods, such as citrus fruits, and drinking plenty of water to stay hydrated also play roles.